We’re not going to sit here and pretend that tomorrow’s release of the conclusion to the cinematic adaptation of Ayn Rand’s classic dystopian novel, Atlas Shrugged, is likely to set the world on fire. It might not even be a decent movie. Hollywood has a knack for squandering excellent source material. 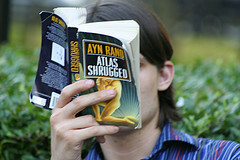 So what does Atlas Shrugged Part 2 have to do with survival? Well, regardless of whether the moviemakers have a clue or not, we all could use a good dose of Rand’s particular brand of philosophy based on libertarian ideals, individual responsibility, free capitalism, and a government that leaves us the heck alone. As we put fingers to keyboard, the cinematic release of the conclusion to Atlas Shrugged, by Ayn Rand, is less than 10 hours away. To most people, this probably qualifies as a non-event. The first film cost only $20 million to make, was shown in fewer than 300 theaters domestically, and earned back a paltry figure of less than $5 million, an anemic performance by any measuring stick. With the sequel set to show in over a thousand theaters, there’s a chance it will make at least somewhat of a bigger splash than part one, but we shall see. The problem the film ran into the first time around was that – adapted from Ayn Rand’s magnum opus and applauding the themes of individual responsibility and capitalism – leftist leaning Hollywood didn’t want to have anything to do with the flick, so it was left to struggle along with a low budget and narrow distribution. “Atlas Shrugged is a novel by Ayn Rand, first published in 1957 in the United States, Rand’s fourth and last novel, it was also her longest, and the one she considered to be her magnum opus in the realm of fiction writing. Atlas Shrugged includes elements of romance, mystery, and science fiction, and it contains Rand’s most extensive statement of Objectivism in any of her works of fiction. The book explores a dogmatic dystopian United States where many of society’s most productive citizens refuse to be exploited by increasing taxation and government regulations and go on strike. The refusal evokes the imagery of what would happen if the mythological Atlas refused to continue to hold up the world. They are led by John Galt. Galt describes the strike as “stopping the motor of the world” by withdrawing the minds that drive society’s growth and productivity. In their efforts, these people “of the mind” hope to demonstrate that a world in which the individual is not free to create is doomed, that civilization cannot exist where every person is a slave to society and government, and that the destruction of the profit motive leads to the collapse of society. The protagonist, Dagny Taggart, sees society collapse around her as the government increasingly asserts control over all industry.